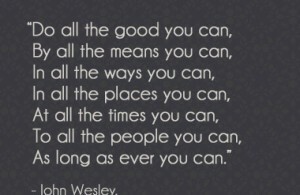 The residents of the Oaks of Wellington, a + 55 community located in Manassas, are an example of those very words of John Wesley. Several of their community members had an arts and crafts fair which provided hand crafted items for the public to purchase. They raised, and generously donated, the $310 dollars, to ACTS! We can only say “Thank You” for caring and being an important part of the service ACTS provides in the Greater Prince William community.